Pokemon Moon DIY T-shirt. How will you celebrate the release? For those unaware, Nintendo is set to release Pokemon Sun and Moon on November 18th. Naturally, my son and his friends are brimming with excitement. Being the crazy, glutton-for-punishment Mom that I am, I started looking into freebies or events related to the game. I was thinking more like free codes for Pokemon, but found GameStop will be holding an event the night before the midnight release and Target will be offering free game posters on Saturday . That isn’t the problem. It’s when my crafty son decides to do a crafty project at almost the last minute…a project that requires material I don’t necessarily have. 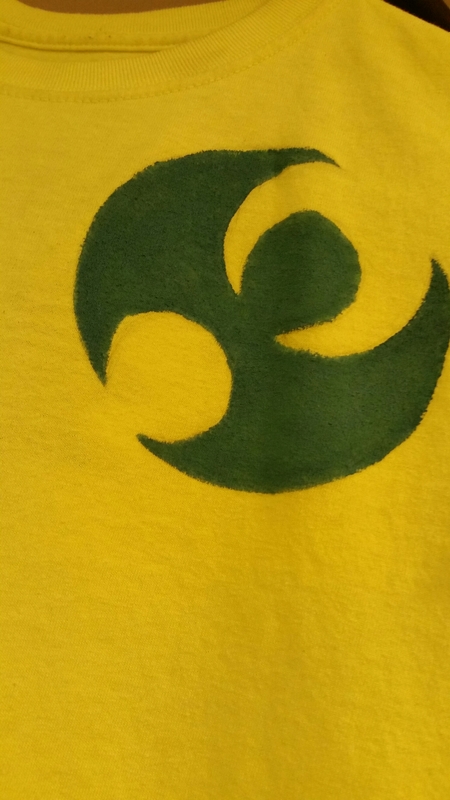 Cue the request for a Z-moves symbol on a shirt. Okay…I don’t exactly have fabric paint, but I’ll do what I can with the paint I have. So I managed and got it done and he was happy. 1) We had a used, old, solid color t-shirt. Lighter colors work best, obviously. 2) I didn’t have fabric paint, so I had to use what was available: acrylic paint with a little bit of water. No doubt it’ll come off a bit in the wash, at least that’s what I expect. I’ll give an update when I get around to washing the t-shirt…if my son ever lets me. 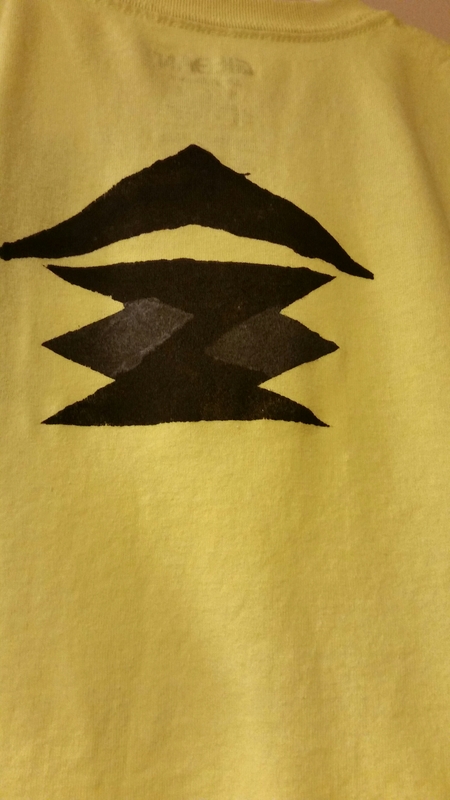 3) Printout of the symbols, cut into a stencil and fixed to the shirt. Note: I had Elmer’s adhesive spray that I used to keep the stencil in place. Double sided tape or maybe duct tape would also work. The idea is to keep the stencil flat while you paint. For the Moon symbol, I sketched it on the shirt with a pencil (because I was lazy and didn’t want to print and cut another stencil out), but a stencil would have worked as well. I imagine painting a base coat of white first before the final color would have been better, especially on a neon yellow shirt. But I didn’t bother with that this time around. Keep in mind, fabric paint would be preferable, but for a frugal Mom like me, I’d rather use what I have at home to save money. Not perfect, but “good enough” for an event that’s a day away. I don’t want to go out and spend $20-30 on a t-shirt he’ll quickly outgrown (both in size and interest). Do you have kids excited for the game release? Or are *you* excited for the game coming out? Let me know what crafty and creative ideas you’ve come up with to celebrate Pokemon Sun and Moon, or just Pokemon in general. This entry was posted on November 15, 2016 by Elizabeth Los in Daily Ramblings, The Frugal Family and tagged Paint, pokemon, Pokemon Sun and Moon, T-shirt.